BRUSSELS -- European policymakers are working on "last chance" options to bring Greece's debts down and keep it in the euro zone, with the ECB and national central banks looking at taking significant losses on the value of their bond holdings, officials said. Private creditors have already suffered big writedowns on their Greek bonds under a second bailout for Athens sealed in February, but this was not enough to put the country back on the path to solvency and a further restructuring is on the cards. The latest aim is to reduce Greece's debts by a further 70 billion to 100 billion euros, several senior euro zone officials familiar with the discussions told Reuters, cutting its debts to a more manageable 100 percent of annual economic output. This would require the European Central Bank and national central banks to take losses on their holdings of Greek government bonds, and could also involve national governments also accepting losses. 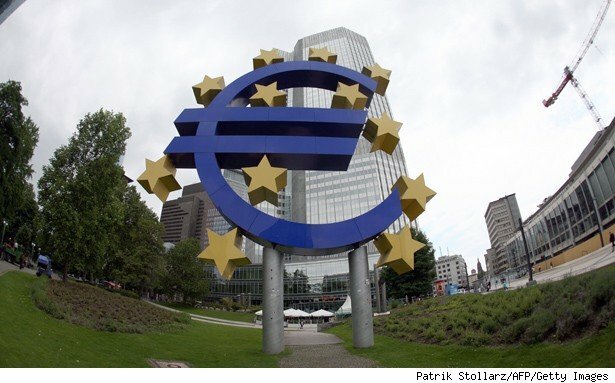 The favoured option is for the ECB and national central banks to carry the cost, but that could mean that some banks and the ECB itself having to be recapitalised, the officials said. The ECB declined comment on Friday. Planning is in the early stages and no formal discussions have yet taken place. But there is an awareness that Greece is way off-track in improving its finances and that aggressive action is needed to keep the country inside the euro zone. Officials described a further restructuring of Greek debt as a last chance to restore the country to solvency, with the agreed goal of cutting its debt to 120 percent of GDP by 2020 already seen as far beyond reach. The International Monetary Fund, a party to the two rescue packages Greece has so far received, is in favour of overhauling Athens's official-sector loans -- a process policymakers refer to as "OSI" or official-sector involvement. "If I were to assign a percentage chance to OSI in Greece happening, I would say 70 percent," one euro zone official involved in the deliberations told Reuters. One of the options being worked on would involve the ECB and national central banks in the Eurosystem writing down the value of the Greek government bonds they hold by 30 percent, under a process that bankers refer to as a "haircut." Total outstanding official-sector credits to Greece, which also includes bilateral loans extended to Greece by eurozone governments, is about 220-230 billion euros. A 30 percent writedown would therefore amount to slightly more than 70 billion euros, one official said. Another put the figure at between 70 and 100 billion euros, depending on how the process is carried out. "It is very complicated and the precise method has not been decided yet because it is very early days," one source said. Officials considered writing down the value of official-sector loans to Greece last year when they were putting together the second EU/IMF rescue program, which focused on the restructuring of Greece's private-sector debt. But OSI was deemed too politically sensitive at the time and was pushed into the background. One official described that as a missed opportunity and suggested it should not be repeated. "The big mistake was that we didn't manage to haircut the Greek government bonds that were in the investment portfolios of the national central banks. That was really, really stupid," the official told Reuters. Politically, it may be easier for policymakers to get the ECB and national central banks to take a hit on their bond holdings, rather than euro zone governments which would mean that taxpayers suffered direct losses. However, the process would still come with complications. First of all, several national central banks would probably have to be recapitalised, officials said. Two officials indicated that the French, Maltese and Cypriot central banks were most exposed to Greek government debt and would probably need a capital injection. Two other officials said the ECB could also need balance sheet support. "The preference is that the OSI would happen on ECB books," one of the sources said. "The ECB would have to be recapitalised as a result, but that would be politically much more acceptable than a loss for taxpayers." Another of the sources said that while the ECB held reserves to cover such writedowns, a restructuring of Greece's debt could require "action to protect the balance sheet further". Asked about the exposure of specific national central banks to Greece, one of the four officials Reuters spoke to said: "France has a huge amount. Very large." Asked whether that would not mean a recapitalisation of some central banks, he replied: "Yes, but so what?" The Cypriot and Maltese central banks did not immediately respond to queries. The Bank of France referred calls to the ECB.